This information is for the benefit of Host Home Providers and agency staff to assist them in protecting the health and safety of each Individual served. These are “quick tips”, meant to serve as a reference in the event of an emergency. These tips are not inclusive of all possible emergency situations. If you or the Individual in your care find yourselves in an emergency situation YOUR BEST OPTION ALWAYS IS TO CALL 911. File a verbal report with your Program Manager as soon as possible and only after you have ensured the Individual’s safety and/or have initiated emergency care. Contact the office or your Program Manager directly at the phone numbers listed above. File a written Incident Report (under “Medical Forms”) within 24 hours of the emergency with Evergreen Service Providers. PROTECT YOURSELF AND THE INDIVIDUAL IN YOUR CARE FIRST! Colorado is known for having a wide variety of weather conditions, and those conditions can change quickly with sometimes severe and damaging results. When threatening weather is advised, take precautions to protect yourself and the Individual in your care, accordingly. When a thunderstorm threatens, you’ll likely hear thunder or see lightning. No place outside is safe when thunderstorms are in the area. If you hear thunder, lightning is close enough to strike you. When you hear thunder, immediately go inside a home or large building, or stay inside your automobile when traveling. REMEMBER the 30/30 lightening safety rule: Go indoors if, after seeing lightening, you can’t count to thirty (30) before hearing thunder. Stay indoors for 30 minutes after hearing the last clap of thunder. Secure outside doors and windows. Avoid showering or bathing. Plumbing fixtures can conduct electricity. Avoid use of corded phones (unless an absolute emergency), computers, and other electrical equipment that put you in direct contact with electricity. Cell phones and cordless phones are safe to use. Unplug appliances and other electrical items such as computers and shut off air conditioners. Power surges from lightening can cause serious damage. Use battery operated radios for weather updates. Never lie flat on the ground. If you find yourself hopelessly isolated in a level field or prairie and you feel your hair standing on end (Indicating lightening is about to strike), drop to your knees and bend forward putting your hands on your knees. Never take shelter under an isolated tree. Stay away from objects that conduct electricity including wire fences, clotheslines, metal pipes, metal rails and other metal objects that would carry lightning to you from a distance. Immediately get out and away from ponds, lakes, pools and other bodies of water. IN A WOODED AREA seek shelter in a low area under a THICK growth of small trees. Be alert for flash floods. 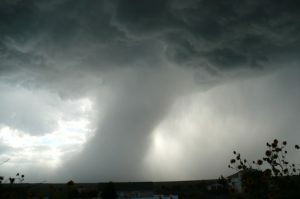 Tornadoes are violent and can destroy well-made structures, uproot trees, and hurl objects through the air like deadly missiles. A tornado WATCH means a tornado is possible. A tornado WARNING means a tornado is already occurring or will occur soon. Get to a safe place immediately. Seek shelter in a basement or sturdy building. If you can’t quickly walk to a shelter, immediately get into a vehicle and try to drive to the closest sturdy shelter. Stay away from bridge/highway overpasses. If you encounter strong winds and flying debris, pull over and park, keeping your seat belt on and engine running. Put your head down below the windows, covering your head with your hands and a blanket if possible. Identify a safe place in your home where household members will gather during a tornado. Best places include a basement, storm cellar, or an interior room on the lowest floor with no windows. Stay away from windows, doors, and outside walls. Get under sturdy tables and use your arms to protect your head and neck. Do NOT open windows. In a high-rise building, pick a hallway in the center of the building. You may not have enough time to go to the lowest floor. 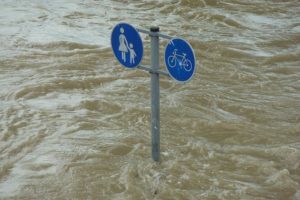 Floods and flash floods almost always occur during or after a period of heavy rain, but other factors can contribute to flooding, especially around or near low-lying areas: melting snow, clogged or inadequate gutters, and poor road drainage systems. Do not drive over a flooded area or around barricades. Abandon a stalled vehicle and immediately move to higher ground. Avoid moving water – six inches can knock you off your feed and 18-24 inches can float a car. Avoid standing water – it will likely be contaminated and contain large amounts of debris. Stay alert for changing weather conditions. If you receive a flash flood warning, evacuate safely or go to the highest floor in your house. Take emergency supplies with you (food, water, flashlight and battery-powered radio). If possible, go to a room that has a hard-wired telephone. Listen for news reports to learn if the community water supply is safe to drink. Avoid flood waters: water may be contaminated from gasoline, raw sewage, oil, etc. Water may also be electrically charged from fallen power lines. 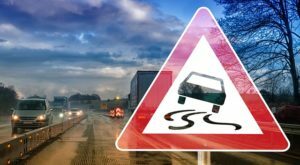 Areas where water has receded may be dangerous from roads that have weakened and may collapse under the weight of your vehicle. Return home when authorities indicate it is safe. Stay out of buildings that are surrounded by flood water. Use caution when entering buildings due to possible damage/hazards. 2 Information courtesy Red Cross. Remain posted on weather conditions. Use your radio, television and Internet news and weather sites to stay informed of current weather conditions and forecasts in your area. 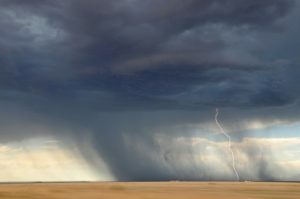 Receiving a few hours’ notice of an approaching storm may enable you to avoid being caught in it, or at the least, be prepared to cope with the storm. A BLIZZARD is the most dangerous of all winter storms. 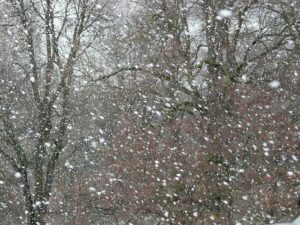 It combines cold air, heavy snow and strong winds that blow the snow about and often reduces visibility to a few yards. A BLIZZARD WARNING is issued when the Weather Service expects considerable snow and winds of 35 miles per hour or more. A SEVERE BLIZZARD WARNING means that a very heavy snowfall is expected, with winds of at least 45 miles per hour and temperatures of 10 degrees Fahrenheit or lower. A HEAVY SNOW WARNING usually means an expected snowfall of 4 inches or more in a 12 hour period or 6 inches or more in a 24 hour period. WARNINGS of SNOW FLURRIES, SNOW SQUALLS or BLOWING and DRIFTING snow are important because visibility may be reduced and roads may become slippery or blocked. SLEET consists of small particles of ice usually mixed with rain. If enough sleet accumulates on the ground, driving conditions will become more hazardous due to slippery roads. Travel only if necessary and bring emergency supplies with you (food, water, blankets, shovel, batter-powered radio). If caught in a blizzard, seek shelter immediately. Don’t risk becoming stranded. If your automobile breaks down during a storm and other shelter is NOT visible, REMAIN IN YOUR VEHICLE. SET your directional lights to flashing if you are on a well-traveled road or highway. Hang a clothing item on your radio antenna or car window. Open the hood of your vehicle to indicate auto breakdown. Stay in your vehicle until help arrives. If you have a cell phone, call 911 for emergency assistance. If you are running your engine to stay warm, OPEN a Window to provide ventilation which will also protect you from Carbon Monoxide poisoning. Avoid Over-Exertion – Cold weather itself will place an added strain on your heart without physical exertion. IF YOU ARE IN AN ACCIDENT, the following procedures meet state law requirements. No two accidents are ever the same. YOUR PRIMARY RESPONSIBILITY IS TO YOUR YOURSELF AND YOUR PASSENGERS. STOP the vehicle immediately and remain CALM. Remain at the scene. DO NOT MOVE YOUR VEHICLE. Make certain all passengers are uninjured. Move them out of the vehicle to a safe place away from oncoming traffic. Instruct the Individual in your care to remain where they are and ensure that they remain in a safe area. If the Individual in your care is injured and cannot move, WAIT for emergency assistance. If injuries have occurred, i.e. cuts, abrasions, etc., implement first aid procedures. Place emergency flag or flares in front and back of your vehicle. If witnesses are present other than passengers, request their names, phone numbers and addresses. If it is safe to do so, take pictures of the scene. File a written Incident Report within 24 hours of the accident with Evergreen Service Providers. Visit our Forms page under “Medical Forms”. STOP YOUR VEHICLE as far to the right of the road as possible. Move to the shoulder of the road if possible. Have the Individuals in your care remain in the vehicle unless it is unsafe to do so. If necessary, move them from the vehicle to a safer location, away from traffic. Place reflectors, emergency flag or flares in front and in back of the vehicle to warn on-coming traffic. Notify the office or utilize staff cell numbers if the office is closed. In some accidents, you and your passengers should remain in the vehicle for safety. More severe accidents call for immediate action to ensure the safety of you and the Individual in your cares. FIRE OR DANGER OF FIRE – Stop the vehicle immediately. Passengers should exit the vehicle door farthest from the fire. Passengers should be moved 100 feet from the vehicle to ensure their safety. It is up to the discretion of the Host Home Provider to attempt to extinguish the fire with their vehicle’s fire extinguisher if they feel it is safe to do so. Evergreen Service Providers avidly encourages the driver not to place themselves in danger and to wait for professional assistance. The vehicle is at an angle such that it may tip over. The vehicle has broken down in a lane where it could be struck by on-coming traffic. The driver should determine if the vehicle is in a position that presents danger to the passengers. If it has been determined that the vehicle is at an unsafe angle or stopped in a lane where it may be struck by on-coming traffic, evacuate the passengers from the vehicle and move them away from traffic to a designated safe place and wait for emergency assistance. Call 911 for assistance.